Neymar has broken his footbone alongside ankle sprain and tests on the pro footballer's injured ankle showed a sprain as well as a crack in a bone in his foot, according to Paris Saint-Germain. 26-year-old Neymar was injured in the final quarter-hour of PSG's win over Marseille on Sunday. This has put everyone in doubt his availability for Champions League second leg against Real Madrid next week. Also Read - Neymar Breaks Silence over his transfer News, says "I m happy at Barcelona"
PSG didn't announce a timeframe for the recovery of Neymar in confirming the extent of the injury following an ultrasound and CT scans. 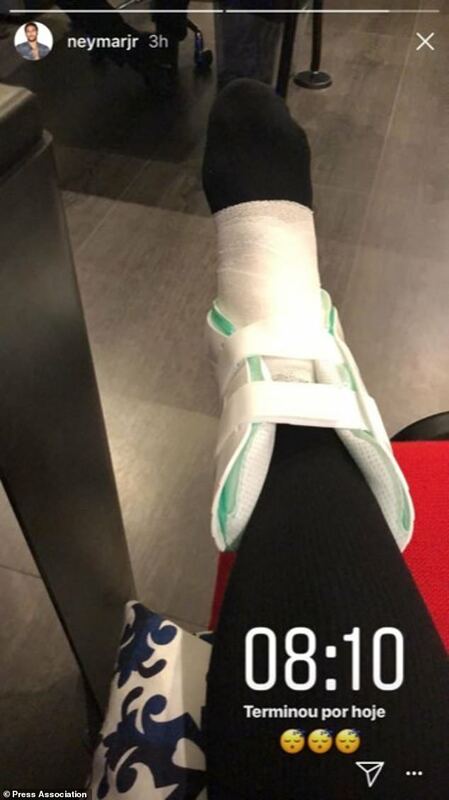 On Monday morning, Neymar shared a picture on Instagram showing his right ankle strapped and with a protective splint, alongside the caption "08:10 Finished for today." With PSG already trailing Real Madrid 3-1 after the first leg, the professional footballer's absence would be a huge blow next week, particularly when considering they spent €222 million in order to acquire him last summer in large part to improve their Champions League record.